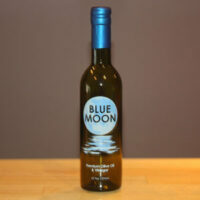 Blue Moon Premium Olive Oil is UP Certified. Ultra Premium (UP) is a new category of olive oil that distinguishes the highest quality olive oil in the world. The UP standard was created by Veronica Foods in response to the growing need to separate high quality extra virgin olive oils from what dominates the so called “gourmet” and “premium” olive oil markets, as well as the broader category sold in mass markets the world over under thousands of brands and private labels. The absurdly low standards created and fostered by numerous trade associations and government agencies responsible for policing them has only contributed to the confusion and misinformation. EU producers are actually given a perverse incentive in the form of government subsidies to keep their oils in storage until market conditions improve. This practice clearly demonstrates the governmental complicity with retailers and bottlers to sacrifice quality for price. Lack of enforcement and testing by these trade associations and governmental agencies has led to a marketplace dominated by inferior oils and rife with adulteration. These practices by some of the world’s largest olive oil producers and bottlers have led to a steep decline in prices of extra virgin olive oil and are driving quality oil producers out of business. The self serving overemphasis on “Where” extra virgin olive oil is produced continues to dominate perceptions at the expense of the far more significant “When, What, and How” the oil is made. The UP standard has as its principal barometers Chemistry and Freshness. These two underappreciated variables can be objectively measured, quantified, and certified. Since the highest quality EVOO comes from high quality fruit coupled with high quality production processes, the UP standard encompasses strict requirements for both the end-product and the production process. No matter how high the quality of fruit and production methods used, the best olive oils in the world are never as good as when they are fresh. There are no standards for shelf-life of EVOO, and the current IOC “best buy” date is intentionally misleading and utilized at the whim of the retailer and bottler. When a quality EVOO is fresh, there is significantly more positive sensory attributes detectable by the palate. As any EVOO ages, it naturally oxidizes losing positive sensory qualities as well as inheriting defects. Newly developed tests can objectively quantify the “Freshness” of an EVOO at various stages in its lifecycle and are referred to as the “Fresh Pack” tests encompassing both the Diacylglycerol Content (DAGS) and Pyropheophytins (PPP). The UP standard is reserved for the finest extra virgin olive oils in the world, as such, the UP grade exceeds all existing European, Italian, Spanish, Greek, North American, Californian, or any other standard for the grade known as extra virgin olive oil. In order to qualify for the UP grade, the extra virgin olive oil must meet or exceed a comprehensive set of Production, Storage, Transportation, Testing, Chemistry, and Organoleptic requirements as set forth in the following document. Instead of placing an overemphasis on what is less important (Terroir) to the detriment of the most critical factors (Chemistry and Freshness), the UP program is intended to reward farmers for producing high quality oil. The UP program is intended to promote Fair Trade practices and help create a demand for a higher quality product thereby increasing the value.